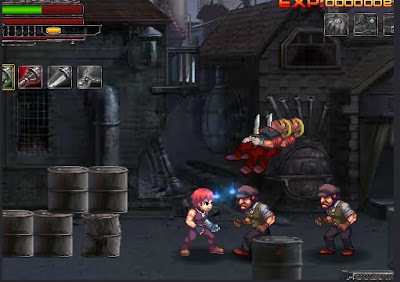 Arm of Revenge is a platformning brawler game with amazing graphics and action gameplay developed by funnaut. If you like, Street Fighter, Devil May Cry, King of Fighters and other fighting game with involving combo moves and super techniques, then chances are great that you will like this flash game as well. There are more than 30 skills to combo, 3 types or cyborg arm to change and a survival mode. You can purchase skill upgrades and enhancements by going to the pause menu and pressing power-ups. Each upgrade costs exp points. Meanwhile, here is AORW Arm of Revenge Walkthrough showing some crazy 100 plus hits combos and boss battle.